It is a tragedy and outright shame that our "Deaf Min".......sorry,Def. Min. St.Anthony,who hails from the maritime state of Kerala,which has traded with Europe from Roman times and which saw just over 500 years ago the arrival of the European navies off the Malabar coast which led to the conquest of India,so insensitive and indifferent to the critical requirements of the Indian Navy.The crisis in the sub fleet even before the disaster of the S'Rakshak,was the worst kept secret of the IN.Warships languishing without their air defence SAMs,an aging small anti-sub helo component,where about 100 ASW helos are required asap.What on earth is the DM doing? Does the UPA/Congress want India to be defeated in the next war? One can only describe this callous attitude as the worst case of dereliction of duty since '62. History is repeating itself this time as a farce after the tragedy of '62,and strangely enough,we have another Keralite DM (no disrespect to the loyal and patriotic people of Kerala) supposedly in charge,allegedly more interested in affairs of his home state than the state of India's security. OT related to salvage operations of naval vessels. NEW DELHI — Western competitors could face stiffer competition from the Russians in India’s forthcoming US $12 billion tender for the purchase of six conventional submarines. The Indian Defence Ministry is requiring that submarines in the competition be capable of mounting the Indo-Russian BrahMos cruise missile. India’s Defence Research and Development Organisation, which is jointly producing the BrahMos with Russia, has persuaded the MoD to incorporate the requirement for the tender, expected to be floated by the end of the year. DCNS of France, Navantia of Spain and HDW of Germany will offer their submarines in the competition. 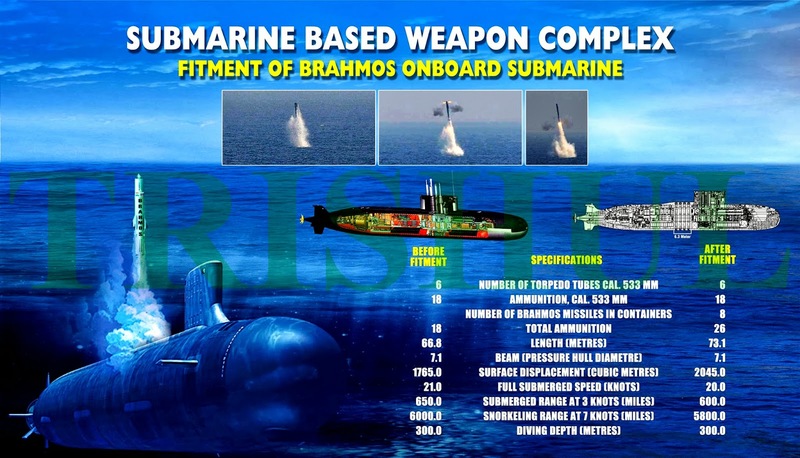 The Russians, meanwhile, told the Indian Navy this month that their Amur-class submarines could accommodate the BrahMos missile with little modification. No executive from DCNS, Navantia or HDW would comment on their boats’ ability to carry the missile. India is finalizing a formal tender to purchase six advanced conventional submarines with air-independent propulsion technology. The six submarines are to be purchased within the limitations of the Missile Technology Control Regime, which restricts the proliferation of missiles capable of flying beyond 300 kilometers, an MoD official said. BahMos is homemade and has a range of less than 300 kilometers, which would be best suited for the submarine, the MoD source said. The submarines are to have a surface speed of 12 knots and submerged speed of 19 knots. They will have a range of 50 to 60 days of navigation on the surface and 20 to 30 days of navigation submerged at 4 knots. Two of the six submarines are to be made in the overseas shipyard and the remaining four are slotted to be license-produced only in a state-owned shipyard. The major fire on the Russian-made Sindhurakshak last month has dropped the operational strength of the Indian Navy submarines to only 11. With the decommissioning of the aging German HDW-class submarines next year, the Indian Navy’s total submarine strength could fall to as low as seven by 2015. The fact that the Indian Navy’s submarine fleet size has dropped so low is a point of major concern in the ranks, especially since China’s sub fleet is more than 60, an official said. Unbelievable laxity by Anthony in terms of addressing critical deficiencies. ASW choppers, Barak missiles, 155mm artillery ... the list goes on and on.. He is chota MMS basically will not take any action even if some one is caught robbing in front of him in broad daylight but will claim innocence . The long-delayed aircraft carrier INS Vikramaditya will be inducted into Indian Navy by Defence Minister A K Antony during his Russia visit slated between November 15-17. After a delay of around five years, the 45,000 tonnes aircraft carrier is expected to be handed over to the Navy on November 15 in Russia, where it is presently undergoing refit. "The Defence Minister is expected to induct the warship into the Indian Navy during his visit for the Indo-Russian Inter-Governmental Commission for Military and Technical Cooperation meeting now expected to be held in November," sources said here. The visit was earlier scheduled to take place in the third week of October but was put off by the Ministry. Vikramaditya, formerly known as Admiral Gorskhov, has completed all its trials in the last two months in the Barents Sea and the White Sea after a delay of around five years on several counts. Once inducted, it will be the second aircraft carrier in the Navy after INS Viraat, giving a strategic advantage in the Indian Ocean. Vikramaditya, which was scheduled to be delivered in 2008, was supposed to have been handed over to India on December 4, 2012, but sea trials in September that year revealed the ship's boilers were not fully functional. It then returned to the shipyard for fixing of the problems that were detected during the sea trials. The two countries had signed the USD 947 million Gorshkov deal in 2004. The deal amount was revised later to USD 2.3 billion. The induction of Vikramaditya, which is expected to reach India in January 2014 and will be berthed at the Karwar naval base, will bolster India's maritime prowess in the region. The Navy also has plans of inducting the Indegenous Aircraft Carrier, which is likely to join operational service around 2018-19. During the Russia visit of the Defence Minister, India is also expected to finalise several important deals including a proposal to procure over 200 T-90 tanks. The meeting of the IR-IGCMTC is held every alternate year in India and Russia where future cooperation in defence matters between the two sides is decided. The two sides are expected to discuss a number of deals including the issues relating to the ongoing Fifth Generation Fighter Aircraft (FGFA), being developed by Russia jointly with Hindustan Aeronautics Limited (HAL). India is also likely to address Russia's unhappiness over India's perceived inclination towards the American weapon systems for meeting its defence requirements. However, Russian-origin equipment still form over 60 per cent of the inventory in the three Services due to the strong long-standing military ties between the two sides. Bodies of two defence personnel were found under suspicious circumstances on the railway tracks falling under Pendurty railway station (PRS) limits of East Coast Railways (ECoR) here on Sunday morning. On being informed by railway trackmen, Government Railway Police (GRP) at Visakhapatnam railway station immediately reached the spot. Following enquiries, one of the deceased was identified as KK Josh, 34, chief engine room artificer (CERA) at Shipbuilding Centre, a unit of ministry of defence at the Eastern Naval Command (ENC) premises here. The other was identified as Abhish Shivam, 33, a chief engineer working at INS Arihant, India's first nuclear-powered submarine. While Josh, a resident of Kakani Nagar near the airport, was a native of Kozhikode, Shivam belonged to Ernakulam district in Kerala and was living at the Navy quarters at Dolphins Hills. Both of them were posted in the city three years ago. The GRP team along with a dog squad and fingerprint team scouted the area around the tracks and collected clues. While GRP cops maintained that a case was registered and awaiting the postmortem report from King George Hospital, relatives of the deceased and the leaders of Kerala Kala Samiti (KKS) alleged that the deaths appeared to be under suspicious circumstances and demanded that the police immediately launch a high-scale probe into the incident. Highly suspicious and a great human loss too.These engineers may have received advanced training in Russia as a sizeable number of naval submariners were sent there for training prior to the ATV/Chakra's arrival. The death of Naval official Abeesh T Shivan, 32, at Vishakhapattanam came as a shock to the residents of Okkal, near Perumbavoor. The relatives said that they were devastated when they were informed about Abeesh’s death by a Naval official at Vishakhapattanam over phone. Abeesh had recently come home and spent some days with his family last month. They ruled out any possibility of suicide and said that the death was suspicious in nature. Abheesh is the son of Okkal SNDP branch president T D Shivan and former teacher of Okkal Sreenarayana Higher Secondary School. He is survived by wife Lekha and son Aryan. Abheesh’s brother Ajish will reach Vishakapatnam to receive the body and bring it to Okkal. On Sunday, the bodies of Abheesh and Cherian K Josh, both naval employees, were found dead on the railway track under mysterious conditions near Pinagadi Railway Station at Pendurthi in Visakhapatnam district. Association of Keralites President N M Pillai alleged that the death of the two naval employees are a clear case of murder. “We have informed our stand to the police and have demanded a thorough probe into the matter. We have taken steps to ensure that the body will reach Kerala immediately after the postmortem examination is completed,” he said. Meanwhile,here's a report on further PLAN sub abse construction and the regional threat it poses. To expand its maritime influence in the disputed South China Sea, China is not only building an aircraft carrier base but is also establishing an underground submarine facility off Hainan island, reports Tokyo's Mainichi Shimbun newspaper. Various Southeastern Asian nations with interests in the contested waters, including Vietnam and the Philippine, are also strengthening their naval power through purchasing new ships, the paper said. The Vietnam People's Air Force has begun to patrol the air space of the disputed Spratly (Nansha) islands, while President Benigno Aquino III of the Philippines declared that the country will invest around US$1.8 billion to modernize its navy. Since the defense budget the People's Liberation Army is set around US$100 billion a year, the Philippines is unable to keep up with China's maritime development alone. According to reports, Japan — which is also locked in a territorial dispute with China in the East China Sea — will provide 10 retired patrol vessels to the Philippine Coast Guard. Meanwhile, to prevent the PLA Navy from entering the Indian Ocean, the Indian Navy continues to construct its indigenous submarine after INS Vikrant, the nation's first domestic carrier was launched this August. As the PLA Navy currently has 270 advanced warships in service, the US Navy plays a critical role in the region, recently deploying Littoral Combat Ships to Singapore to counter China's rising naval power. The Spratly islands are contested territory in the South China Sea. The group of more than 750 reefs, islets, atolls, cays and islands are claimed in whole or in part by China, Vietnam, the Philippines, Brunei, Malaysia and Taiwan. My apologies if it had been already posted.